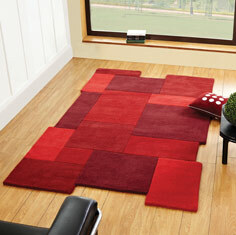 Live on the edge with one of our stunning Abstract rugs. Handmade from pure soft woollen yarn, the edges contour the design, this adds a unique overall look to each rug. Available in two designs, Board-walk and Collage. Colours are stone and red, custom made sizes are available to order.